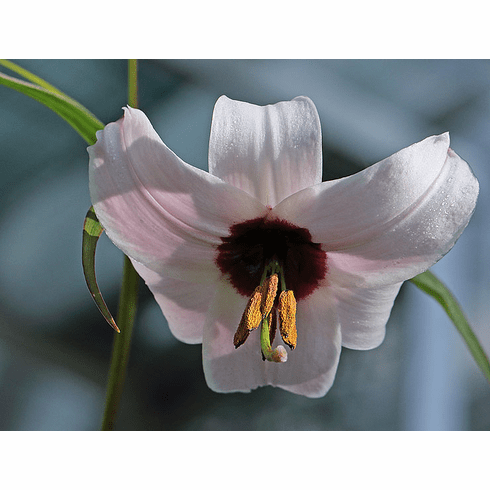 Named for Prince Henri d'Orleans, this is a very rare lily that was once classified as being nomocharis. Its native habitat is the Gongshan and Lanping areas of the Yunnan Province, China and in the Mekong and Salween drainage at an elevation range from 9,000 to 11,000 feet (2,700 to 3,300 meters). Flowers can vary from white to light pink with blackish centers. Exceptionally difficult to grow under cultivation, it normally produces 5 or 6 flowers in July from mature bulbs in a raceme inflorescence. It comes from a wet monsoon climate and succeeds best in a moist and cool coastal location with light shade. Scotland seems to be very much to its preferred climate. Cold, soggy winter soils will cause the bulbs to rot. Both our title photo as well as the insert contributed by Steve Garvie of Scotland. Photos copyrighted Steve Garvie, all rights reserved. Used with permission.